Pantano started out racing at the age of nine and ended up with one of the best records ever in kart racing. He quickly established himself as the leading light of his generation with a spectacular treble of the Italian, European and World titles in his first year in Cadet karting. He followed up in 1994 with the Italian and World titles in Junior karts and then in 1995 pulled off a remarkable achievement by winning the Formula A European title in his debut year. Too young to go to Formula Super A, he won the title a second time in 1996. Signed up by AMG Mercedes-Benz in 1996, Pantano looked to be in the fast lane to Formula 1 but then went through a difficult patch as others fought over control of his career and it was not until 2000 that he was truly able to return to the limelight. He took part in the four races of the Palmer Audi winter series of 1999 and then tested an Astromega Formula 3000 before signing for the KMS team to race in German F3 in his first year of single-seater competition. He caused a sensation by winning his first race in F3 and went on to win the title. At the end of the year he was tested by Benetton. He joined Astromega in Formula 3000 in 2001 and won at Monza. That year he tested for McLaren. A last-minute signing for Coloni in 2002 did not bode well for the season but Pantano won three times and finished the year runner-up to Sebastian Bourdais in the championship. In the winter he tested for Williams and Minardi but unable to break into F1 signed for the Durango team and won two races in the International Formula 3000 series in 2003 to finish third in the championship. He signed for Jordan at the start of 2004 but did not have a happy season and left the team before the end of the year. In 2005 Giorgio joined the new GP2 championship, driving for the SuperNova team. At the same time he did a couple of races in America with Target Chip Ganassi Racing and this was followed by tests with PKV and Conquest Racing. 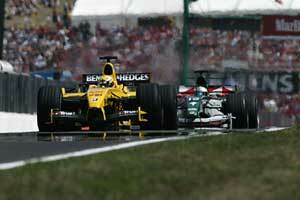 He was looking for work at the start of 2006 but Fisichella Motor Sport came to his aid. He returned to GP2 and won three races and finished fifth in the championshp, despite missing the first six races. That earned him a drive with Adrian Campos in 2007 and there were two more victories and third in the championship and in 2008 his talents were sought out by the Racing Engineering team. In the course of the season Pantano became the most successful driver in the history of GP2, but as he neared the age of 30, his hopes of breaking into F1 were still frustrated.